The Philips Advance Xitanium DALI LED drivers provide OEMs with flexibility in designing luminaires used in DALI networks. Enabled with SimpleSet technology, these drivers offer the needed performance for the application with precise tuning of drive currents and selectable dimming curves. 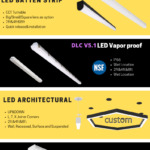 With wide operating windows, slim profile and simple current adjustability, the drivers make it easy for luminaire manufacturers to design linear fixtures with desired lumen levels to suit the application.